This Google Maps mashup presents a number of historical photographs and videos on Google Maps. The map allows you to zoom in on a location and view photographs and videos from the past and compare them with the same view as seen in Google Maps Street View. The map includes a number of quick zoom links below the map which will zoom the map to the chosen city. 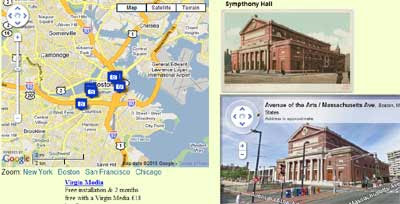 To view a photo or video of a location just click on the appropriate map marker. All the photos on the site come from the New York Public Library Digital Gallery.